We are your one stop shop for quality custom embroidery, promotional items, gifts, company logo apparel, team roster shirts, school spirit-wear, printed tee shirts and embroidered caps. - Retail and Wholesale Custom Embroidery and Monogramming. - Screen Printing, Sublimation and Direct To Garment Printing. - Custom Promotional Items and Personalized Gifts For Every Occassion. - Company Uniform Programs and Web Stores. 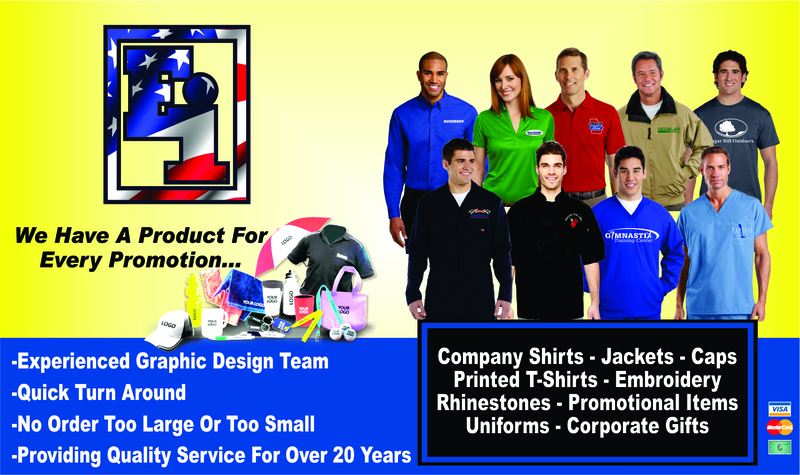 - Company Logo Apparel, School Uniforms and Spiritwear. - Custom Designed Rhinestone, Glitter and Heatpress Vinyl Shirts. - Laser Etching, Custom Patches, Applique and 3D Puff Cap Embroidery. We have been delivering great products with personal customer care and quality services for over 25 years. Send us an email below or call us at (678) 804-4541 to see what we can do for you. All our work is performed right here in the United States by our dedicated staff of local experienced professionals.